The Navman MY450LMT is the first to come standard with monthly map updates free of charge for the life of the device. However, it is let down by slow software and a touch screen that isn't always responsive. The Navman MY450LMT GPS unit is the company's latest top of the range portable GPS unit. It's the first to come standard with monthly map updates free of charge for the life of the device, but is let down by slow software and its touch screen wasn’t always responsive in our tests. The MY450LMT is Navman's top of the line portable GPS unit but the unit itself uses a pretty plain and straightforward design. The bezel surrounding the 5in screen has a brushed aluminum look, while the surround is glossy black plastic. The chrome edging around the bezel is a nice touch, and we like the matte, soft-touch finish on the back and sides. There's a power button on the top of the MY450LMT unit, but it does require a real firm press to operate. 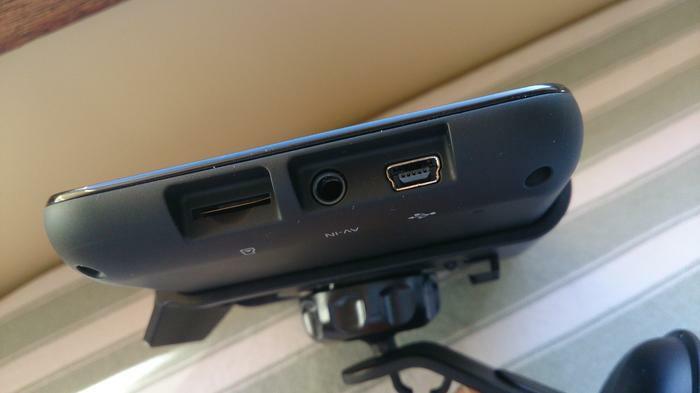 A microSD card slot, an AV-in port (for connecting an optional Navman reverse camera) and a mini-USB port for charging are located on the left side. The window mount is similar to the one used with other Navman units and is easy enough to put into position and adjust, though it does feel a little flimsy. The Navman MY450LMT has a large, 5in resistive touch screen. The display has a matte finish so it performs reasonably well in direct sunlight, but viewing angles are poor. The touch screen isn't the most responsive, especially when entering addresses using the on-screen keyboard. We often had to repeatedly tap the screen to make a correct selection and the software doesn't keep up when typing quickly. The MY450LMT's touch screen isn't the most responsive. The MY450LMT's software is also sluggish in general. The unit takes a good 20 seconds to power on and displays a safety agreement alert that has to be accepted every time you switch it on. In our experience, competing units from Garmin and TomTom do not have the same issue. 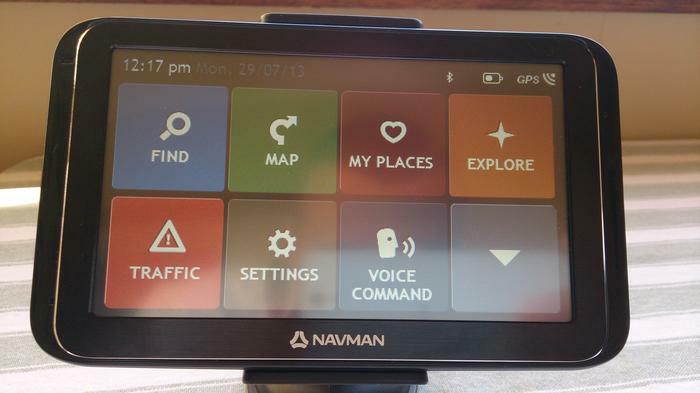 Entering a destination on the Navman MY450LMT is done via a single "find" menu where you can search using an address, keywords, POI's, intersections, GPS coordinates, postcodes or by picking an area on the map screen. The keyword search works reasonably well and can save time. For example, you can search "The Star" or "Casino" to bring up similar results. Regular address entry is a three-stage process of city, street, then the house or building number. The Navman MY450LMT's map screen is spacious in size and reasonably easy to read. Street names are clear and a small yellow arrow points to each street to minimise confusion. Tapping anywhere on the map brings up a map options menu where you can bring up zoom controls, make a detour, see an overview of your route or cancel the route. The route overview displays a list of all the turns, a complete overview of the route and information including distance to go, ETA and average speed. You can also adjust the voice volume in this menu, though we wish you could do this on the map screen itself to save an extra screen press. Voice guidance is clear and comprehensive and the MY450LMT includes an Australian text-to-speech voice that deals with Australian pronunciation quite well. Audio is loud and clear, but could use a boost when driving in busy city traffic. This is especially evident if you're driving with the window open. Navigation performance is solid. The maps also have a tendency to miss a number of 'no right turns', and also didn't warn of some red light cameras that we passed, although we were alerted about speed cameras and accident black spots in their correct locations. School zone warnings are also included and are time relevant, so the warnings only appear when it's between 8:00am - 9.30am and 2.30pm - 4:00pm in NSW (and the relevant times school time zones when used in other Australian states). Unfortunately, they aren't automatically disabled during school holidays. Being a top of the range unit, the Navman MY450LMT includes lane guidance & 3D junction views, speed sign & limit alerts, landmark guidance, and live traffic updates.. Junction views and lane guidance are very useful when entering and exiting unfamiliar freeways and motorways and worked well during our testing. Speed signs displayed on most roads, though we did encounter various minor roads where they did not show. The MY450LMT also includes Bluetooth connectivity and voice command functions though we experienced issues with both of them. The Bluetooth refused to connect to both a Sony Xperia Z and a Nokia Lumia 925, while the voice command function is frustrating to use. It rarely translated a spoken address, so we found it quicker and easier to enter a destination manually. The MY450LMT's monthly map updates are "verified and validated" on an automatic basis. 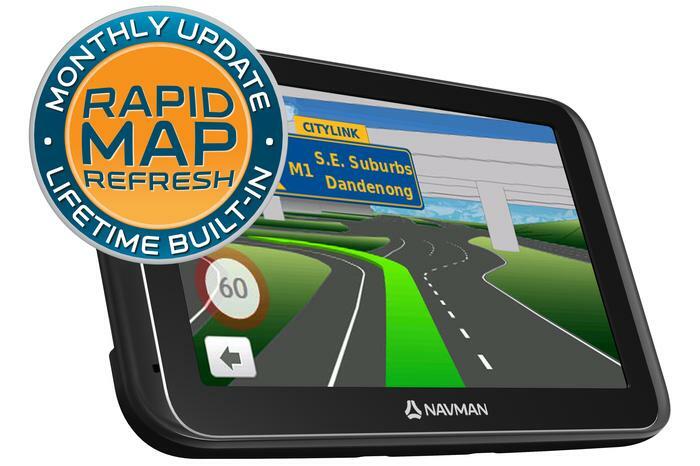 The Navman MY450LMT is the first device to offer monthly map updates, called Rapid Map Refresh. Navman says the monthly map updates are "verified and validated" on an automatic basis, though you do need to connect the unit to a PC or Mac and download the update through Navman's NavDesk software. The Navman MY450LMT is available now through major retailers in Australia and New Zealand for $279.